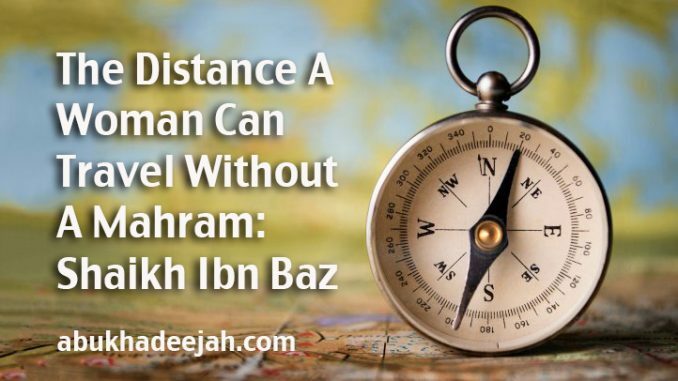 What is the distance at which the Sharee’ah allows a woman to travel without a Mahram? How do we harmonise between those narrations that mention a limit of three days distance, and another that mentions two days distance, yet another that states one day? How many kilometres is a journey of a day in our times? The principle here is: What is termed a journey at which point it is not permitted for a woman to travel except which a Mahram? Everything that is considered a journey, then it is not allowed for a woman to embark upon it except with a mahram, due to the saying of the Prophet (ﷺ): “A woman is not to travel except with a mahram.” In a narration, “For a journey of a day and a night except with a mahram.” In a narration, “For a journey of a day.” In a narration, “For a journey of a night except with a mahram.” In another, “For a journey of three days except with a mahram.” And in another narration, “For a journey of half a day.” So the scholars have stated that Allah’s Messenger (ﷺ) would respond in accordance to the questioner asking the question. So a questioner would ask, “If a woman wishes to travel for the length of a day, is that allowed for her?” So the Messenger (ﷺ) would respond, “She is not to travel the distance of day’s journey except with a mahram.” Another would ask, “Can she travel for the journey of a night?” Another would ask, “Can she travel for a journey of three days?” So Prophet (ﷺ) would answer in accordance to the question asked. It can also be understood that he would answer in accordance with the Revelation sent to him in those situations. Then Allah (ﷻ) reduced the hardship concerning travel. So Allah permitted women to go out in what is not termed a journey. And He did not permit her to go out in that which was considered a journey unless she is accompanied by a mahram. The point is that his (ﷺ) statements could be in accordance with the questions asked. It could also be that Allah forbade the woman from going out for the distance of half a day except with a mahram, then after that, He (the Most High) forbade her from a distance of a day and a night except with a mahram. Then after that, He forbade her from going out for a distance of three days (and so on) – all this due to a far-reaching wisdom. But all this is understood on the basis of what is considered a journey. And a journey is that which agrees with the evidence. In that regard, there are narrations reported in the two Saheehs (Bukhari and Muslim) that place no limits and restrictions on the matter, where the Prophet (ﷺ) stated, “A woman is not to travel except with a Mahram.” So he stated that without any restriction (of days or nights) as occurs in this narration in the Saheeh (of Al-Bukhāri) from the hadeeth of Ibn ‘Abbās (may Allah be pleased with him). This one narration harmonises between all the other narrations. Everything that is referred to, or considered to be a journey, then a woman is not allowed to embark on it except with a Mahram. And least of that is half a day, so she cannot embark upon it because this may expose her to evil, corruption and treacherous conduct. It is not necessary for her to hazard a journey without a mahram. A mahram is her husband and other than him, from those she is forbidden to marry permanently due to blood relations, such as her brother, her father, or a brother through breastfeeding from the same wet nurse. Likewise her paternal uncle through breastfeeding (as they are forbidden for her to marry) and so on. A day and night’s travel is approximately 80 kilometres (or) 75 kilometres approximately. Half a day is therefore 40km approximately. That is because a day and night are 24 hours, so half of that is 12 hours making it 40km or so. So it is upon her that she keeps herself away from that which approaches this. As for normal moving around within the city or town, and to the limits of the city, then she does not require a mahram if she is in the company of other women or she is in a safe locality; in a safe and secure township where she does not fear anything, then there is no problem in her moving about the area, to fulfill her needs. It can be from one house to another, even if is a kilometre or two kilometres, three or four (for that matter). All of this does not harm so long as there is widespread safety, and no danger or suspicion, yes. The Imām, Al-‘Allāmah ‘Abdul-‘Azeez Ibn Bāz (may Allah have mercy upon him). Jazakallah khair Ustadh for this clarification with evidence. Although I knew this principle, the evidence was just vague.The evidence here is much clearer and explained very clearly without ambiguity. May Allah (ta’aala) reward you for your efforts.